The first day of the Urban and Rural Land and Building Tax (PBB-P2) Week in North Jakarta yesterday, managed to collect Rp 140 billion.
" The first day is held up to 5 AM by collecting Rp 140 billion or around 42.67 percent from the target"
North Jakarta Tax and Local Retribution Sub-Agency Head, Carto stated that it has reached 42 percent of the target set in the implementation of the PBB-P2 week, amounting to Rp 328 billion. "The first day is held up to 5 AM by collecting Rp 140 billion or around 42.67 percent from the target," he expressed, Wednesday (9/5). His party targets 177 taxpayers from six sub-districts and Seribu Islands districts. 40 out of them are from Penjaringan and Kelapa Gading. 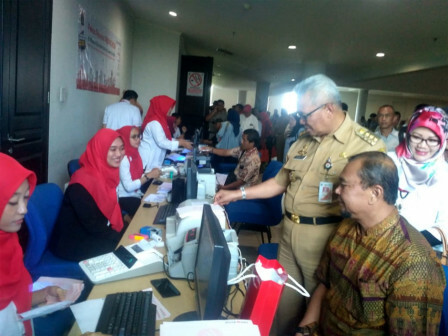 30 taxpayers are from Tanjung Priok, 27 taxpayers are from Cilincing, 22 taxpayers are from Pademangan, 15 taxpayers are from Koja, as well as 3 taxpayers are from Seribu Islands. By so, he believed that Rp 188 billion could be achieved by the end of this week. "The results of the first day are quite significant. I am optimistic that the target for tax realization at Rp 328 billion can be achieved," he stated.